Week 4 of Last Dance on the Beach CAL is designed by Atty. She has a fun and relaxed style about her designs that I really like. Her design with the high waves is one of my favorites for this CAL. With her design Atty looks back on her walk with Wink and her design for Last Dance on the Beach. When I look at the square Atty designed, I see a rough sea with high waves, the beginning of a perfect storm. Like I said, I really like this design and I couldn’t help but go all out on my color placement this week. I am playing with color placement in my Merino Soft Dancing in the Sea kit, for my Color Crafter Dancing in the Sea blanket I am using the colors specified in the pattern. I have made the waves such that they are on a different background color. This means that I change colors at row 4, 8, 12, 16, 20 and 24. I made squares using one, two and three colors using 4.5mm hook for my Merino Soft squares and a 4.0mm hook for my Color Crafter squares. This is the same hook I used for my gauge swatch. 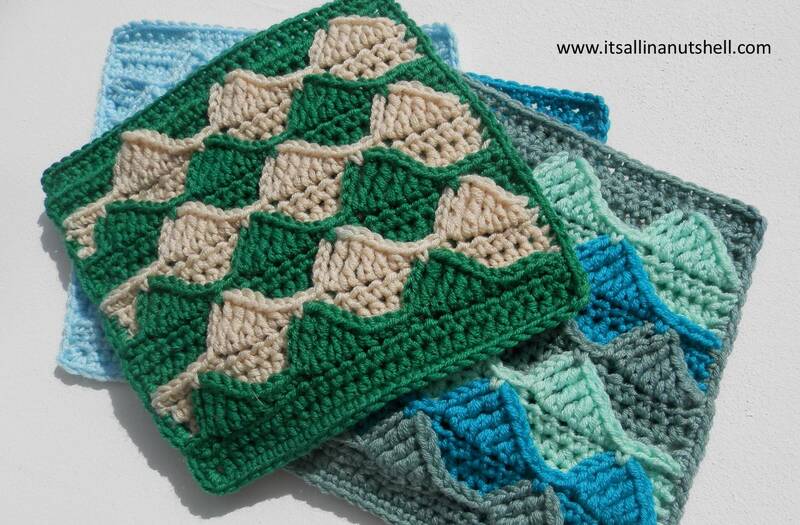 These are the colors that I used from my Merino Soft Dancing in the Sea kit and arranged according to the photograph above from left to right. A note on the squares of this week, I noticed that they tend to pull a bit to one side. I managed to reduce this during blocking but it is still a bit visible. I expect that when the blanket if finished you won’t notice it at all, so don’t worry about it if it happens to you too. All videos for Last Dance on the Beach are available through my YouTube channel and on my blog grouped on two this dedicated video pages, English and Dutch. These pages will be updates as new tutorials become available. I have a video available in English and Dutch. Please note that I use UK crochet terms in the English video. If you are more familiar with US terms, this conversion chart will help you with the most common terms. For those of you that are left handed I have the video for week 4 available in English and Dutch. There are also available on the English and Dutch video pages. Again, please note that the English videos use UK crochet terminology. If you still want to join the CAL, there are kits available in two yarns and in three color ways. You can choose a base kit with Color Crafter yarn or a luxury kit with Merino Soft yarn. The three color ways are Dance in the Sea, Dance in the Rain and Dancing under the stars. Both kits have yarn and a special edition label to add to your afghan. If you choose for the luxury kit you will also get lots of other goodies. And maybe the best part of this project is that 2 euro of each kit sold goes to a charity aimed at helping people with mental health difficulties. Kits are available from Paradise Fibers (USA/CA), Wool Warehouse (UK/International), Deramores (UK/International), or your local Scheepjes stockist. To join the CAL, please join the International (English speaking) or Dutch (Nederlands) Facebook groups. You can post all your photo’s of your squares here and there are lots of people to help you if you get stuck somewhere. The patterns will be posted each week in the Facebook groups and on the Scheepjes website. I hope to see you next week for part 5.